Shogun-ki: Mitsuo....err, Sharpe's? "Samurai Battles"
Usually I don’t like to post negative reviews-I’d much rather feature a good book that others might enjoy and find useful than waste time dwelling on a failed effort. However, sometimes circumstances dictate that a sub par release be drug into the spotlight. That’s why I’m writing about the recent highly anticipated ‘Samurai Battles’ by Mitsuo Kure. Because, you see, ‘Samurai Battles’ isn’t written by Mitsuo Kure at all (despite what the Amazon listing and the publisher Chartwell’s catalog say). Kure’s name never turns up once-as a picture credit, a footnote source, or an acknowledgement. Instead, it turns out that one Michael Sharpe was substituted for Kure at the last minute as author of the title. Who’s Michael Sharpe, you might ask? He’s described as an English teacher living in Japan (which in and of itself is a red flag) and a writer of several books on World War II (which, of course, makes him an expert on pre-modern Japanese history…uh-huh). Sharpe is also the author of ‘Samurai Leaders’, a book so far under the radar that it only came to the Samurai Archives’ attention when one of the board members found it for a couple of bucks on the closeout table at a bookstore. Interestingly enough, that book is also listed as being written by Mitsuo Kure and he had nothing to do with it either. Samurai Leaders was a poor effort, and as we shall see many of its problems were transferred directly to ‘Samurai Battles’. It’s unknown why publishers Chartwell and Compendium are listing Sharpe’s books under Kure’s name. Perhaps Kure pulled out and Sharpe was brought in at the last minute to do a quick fix, but that’s nothing more than idle speculation. At any rate, allowing this book to continue to be listed under Kure’s name is fraudulent and misleading. It could be forgiven if the work in question ended up being well done-but sadly, that’s not the case here. ‘Samurai Battles’ is a pretty straightforward account of 700 years of samurai warfare-roughly 1180 to 1877, although several earlier conflicts are mentioned. There isn’t much in the way of critical thought or analysis-so little that the accounts reminded me of Wikipedia entries. In fact, a comparison of the chapter on the Genpei war with Wikipedia shows that the two tally point by point-they’re not word for word, but I suspect that the similarities are more than coincidental. The information in the book is several years behind the current state of scholarship. For example, Tedorigawa is described as being a major battle between the Uesugi and Oda involving well over 50,000 men-an account that hatched out of a fanciful desire of the Japanese General Staff’s desire to produce an impressive looking ‘official military history’ in the 1890’s. It’s now largely accepted that the battle was a minor rearguard action involving less than 2000 troops. Likewise, Edo period legends are accepted as fact (such as the story of Akechi Mitsuhide’s mother being put to death as retaliation for Oda Nobunaga’s execution of two envoys). Many accounts leave the reader with mistaken impressions-after reading the description of Mikata-ga-hara, one would be left thinking that the Takeda army was decimated and in tatters after the battle rather than having just steamrolled the Tokugawa. And in many places, ‘Samurai Battles’ is just plain wrong-such as stating that cannon were in widespread use in Japan by 1582, and Kawanakajima is described as a naval battle. The layout of the book is puzzling-although it seemingly is trying to follow a timeline, it places the chapter on Hideyoshi’s invasion of Korea (1592-98) after the chapter on Sekigahara (1600). Glaring omissions abound-despite the claims of covering warfare from 1180 to 1877, the Osaka campaigns (1614-15) and the Shimabara Rebellion (1638) are absent. That’s like writing a book on the history of battles in the United States and leaving out World War II. As far as sources, there is no bibliography, but each chapter has endnotes with sources. Some of the sources are from well regarded scholars such as Thomas Conlan or Karl Friday, but one has to wonder if the author has actually read these works or just ‘borrowed’ their citation from footnotes on Wikipedia (which seems to be the case). Otherwise, only articles available for free on the net or the most general surveys (such as Turnbull’s ‘War in Japan’) are used. Many times, one single work seems to be the basis for an entire chapter. Thus, we are subjected to the poorly formulated and highly biased articles of Kenneth Swope as the foundation for the chapter on the Korean invasions. Not mentioned are easily available popular sources on the invasions such as Turnbull’s two books on the war, Admiral Yi’s memoirs or diaries, ‘The Book of Corrections’, or Samuel Hawley’s excellent ‘Imjin War’, all of which leave Swope’s efforts looking like the work of an embittered teenager not invited to the dance. Usually, most coffee table books of this type can garner at least a token recommendation on the basis of a plethora of pictures, maps, photos, and woodcut reproductions. But ‘Samurai Battles’ botches this, too. Many of the shots are poor reproductions and badly blurred. Even worse, many of the images have incorrect captions that clearly have nothing to do with what is being depicted. A famous print of (Taira) Noto no Kami Noritsune and Minamota Yoshitsune at the battle of Dan-no-Ura is captioned as being ‘Tajima the Arrow Cutter’ at the battle of Uji. A detail of the Anegawa battle screen is said to be Tokugawa Ieyasu at the battle of Sekigahara. A print of the famous ‘race across the river’ by two horsemen at the second battle of Uji is captioned as Minamoto Yorimasa from the first battle years earlier. And a print of Nasu no Yoichi shooting the Taira fan at the battle of Yashima is said to be Taira Masakado! Even some of the ‘correct’ captions are lagging behind on scholarship, since they go with the old identifications of works that have been reattributed (such as the scroll painting of Ashikaga Takauji on the back cover, which is now thought to be one of his vassals). Some captions just leave one wondering-a print of the 4th battle of Kawanakajima is identified as such, but also contains totally unrelated text about the effect of Korean and Chinese culture on Japan over a thousand years before the battle was fought. What makes all this even more unforgivable is that these are the SAME EXACT BLURRY AND MISCAPTIONED SHOTS USED IN ‘SAMURAI LEADERS’. The strategic and battle maps in the book are well done, but upon closer examination proved to have been copied from Turnbull’s ‘Samurai Sourcebook’, Sansom’s ‘History Of Japan’, and Solum’s ‘Saga Of The Samurai’. They’re more colorful, but there’s no doubt where they were ‘borrowed’ (and I use the word loosely) from. And yes, they have errors too-the most obvious being the forces of the Western and Eastern armies being reversed in the Sekigahara campaign map. In summary, there’s little here for either neophytes or scholars. Don’t be fooled by the eye-catching cover. 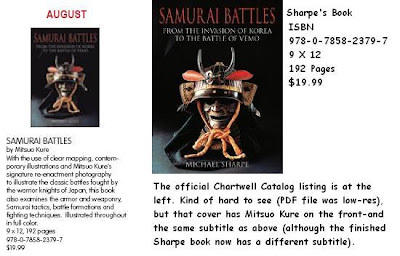 Perhaps someday Kure will indeed write a ‘Samurai Battles’ book, and I’ll be looking forward to it-but my advice to all would be to avoid the Sharpe version at all costs. Thank you for the information. I am surprised that Kure allows his name to remain on the book. Unless he broke some contractual obligation, He should sue to remove his name. And if parts of the book were plagiarized, such as maps from Turnbull's books, then that should not be allowed as well. Thanks! We have contacted Amazon and a couple of other sites about changing the author name on the description. So far, no results. Unfortunately, since the maps have been redone with completely different graphics, there's not much that anyone could do about that.